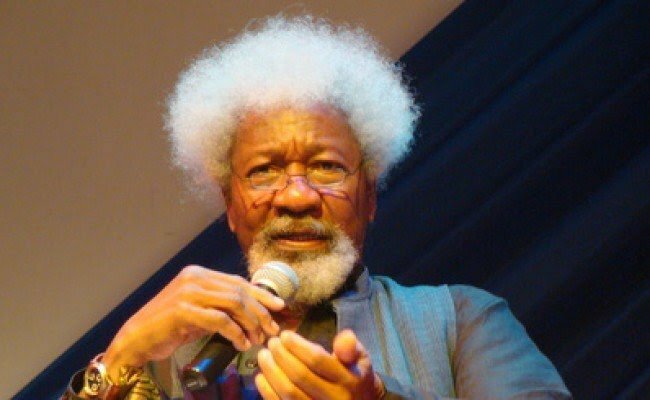 Wole Soyinka, Nobel laureate, says he should be examined by a psychiatrist if he joins the Coalition for Nigeria Movement (CNM) masterminded by ex-President Olusegun Obasanjo. Obasanjo recommended the coalition in a letter he wrote to President Muhammadu Buhari in January. The elder statement had asked Nigerians to rally round the movement, saying neither the ruling All Progressives Congress (APC) nor the Peoples Democratic Party (PDP) could give Nigeria the leadership it deserves. But speaking in an interview with BBC Yoruba, Soyinka said the coalition is not meant for someone like him. “Me? Obasanjo would establish a group and I will become a member of such group? That means they should get a psychiatrist to examine me,” Soyinka said. He also spoke about the letters which Obasanjo and former military President Ibrahim Babangida addressed to Buhari. Soyinka said people should get suspicious “when these soldiers speak” because there is the possibility that “what they have in mind is different from what we have in mind”. “When these soldiers begin to speak, we are supposed to get suspicious and ask what exactly do they have in mind? It is possible that what they have in mind is different from what we have in mind,” he said. "You can look at it from two perspectives, the messenger and the message. The message should be examined closely. We should not look at the misdeeds of the messenger alone. Let’s start by asking, is he saying the truth or telling lies, or is he being tricky? “If he is saying the truth and talking about things that are beneficial to the masses, we would allow that be. After that, we would now look at the person speaking, what is in his mind? … even if it’s a little child who is speaking, as far as that child is saying the truth, we won’t ask the child to keep quiet. We won’t ask the child what do you know? We would listen. It is the same situation with those who have presided over the affairs of this nation without making significant progress.